November is the changeover month from the wet to dry season in Mexico, this means the weather is now perfect for your holiday to start. You can also catch the world famous festival that is ‘The Day of the Dead‘ in which people believe the spirits of the dead return to earth to be reunited with their loved ones, it involves people decorating the graves of their loved ones and playing their favourite music. As you can imagine this festival brings a huge mix of music and colours making it a very special, so join in and party on the streets with the very welcoming people of Mexico. Where else to start than the countries vibrant capital city Mexico City, like any modern-day major city it holds a huge mix of cultures, an interesting history and an excellent range of restaurants, nightlife and hotels making it the perfect place to get a grasp of what Mexico is really about. If it is the culture you are after then Palacio de Bellas is home to some immense murals created by world-famous Mexican artists inside and outside is also a sight to behold with splendid white marble walls and a huge courtyard providing a beautiful centrepiece for this huge city. Teotihuacan is one of many UNESCO World Heritage sites in this region and dates back hundreds of years, sitting around 40 miles north of Mexico City itself these impressive pyramids are a site to behold with a number of different palaces which are from the pre-Columbian times being the largest of this era in the whole of Mexico (day tours can be arranged by one of our team just simply ask!). Next up is the holiday resort which attracts millions of visitors a year, Cancun, set in the Yucatan Peninsula your sure to have a lot of fun here! The weather in this region is pretty brilliant all year round however the average temperature for the month of November is around 29 degrees making it the perfect beach climate and this region is famed for its beaches. As resorts go we work closely with a number of operators who have some stunning resorts in the Yucatan area but there is one that really stands out – Club Med, Cancun Yucatan. This is the ideal Club Med resort for both families and couples. Self-contained around a stunning central square, the resort has a host of speciality restaurants and bungalow style accommodation. The Cancun Yucatan resort also offers travellers the chance to upgrade to the Jade Luxury space, which includes higher-grade rooms and dedicated staff to assist on arrival and throughout your stay. Contact one of our team to find out more information and prices and packages today! The Yucatan region is much more than a holiday resort, it also holds a lot of value you in the history of Mexico, Chichen Itza is the largest of all the Mayan wonders hidden within the jungle you can understand why it is down as one of the New 7 World Wonders. From Cancun it is an easy day trip and one that you simply must take, contact our team for more information about this day tour. Another hot bed for visitors to Mexico is the booming beach town of Tulum. The setting of Tulum is one of the factors as to why it is so special, it is where the jungle meets the beach attracting hipsters from far and wide to this very unique place creating an atmosphere which can’t be found anywhere else. Located around a two hour journey from Cancun it is a peaceful alternative with the same standard of resorts and restaurants Tulum is seen to be a place for more of a peaceful and spiritual experience with a huge yoga community embracing open mindedness in many different forms. Now even though November is officially the start of winter in Malaysia it is the month with the least rainfall which can be a huge deciding factor when travelling to Malaysia . Starting off in Kuala Lumpur a metropolitan city famous for its impressive skyline and hugely interesting history. Some of the most ionic buildings you will find in Asia are the Petronas Towers lighting up the KL skyline they are hard to miss with the best views of them coming from the large number of rooftop bars the city has to offer. Another great way to enjoy some of the best views in KL is to climb the Petronas Towers themselves and do the skywalk from one tower to another not for the faint hearted – book your ticket in advance to avoid disappointment this should cost around ten pounds. Now one thing this city does have in abundance is shopping with two of the main markets situated in Chinatown being the Pettaling night markets packed to the brim full of stalls selling pretty much everything you can think of but particularly good for clothing and electronics so get practicing your haggling to find the best bargains. 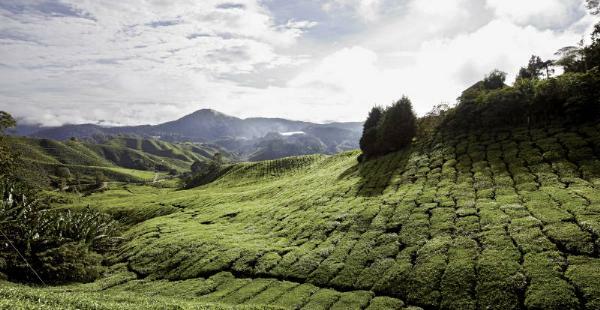 Around a beautiful three hour transfer from Kuala Lumpur by car or bus you will find yourself in the Cameron Highlands a very unique settlement in the mountains of central Malaysia it feels like you could be in the Alps with a huge British influence bringing in fresh bakeries and some very quirky cafes. Home to some the best tea on the planet (certainly the best tea I’ve had in Asia) this town is surrounded by hills and hills of tea plantations which are delightful to stroll around with a cup of tea and slice of cake waiting for you at each pit stop – see how the tea is made with a tour around any of the tea plantation factories and bring some back for the family to taste! After a refreshing couple of days up in the highlands I recommend your next destination be the quirky coastal Georgetown a hotspot for street art as well as delicious street food complimented with a number of bars to wash down your dinner with a refreshing beer. Now it’s time to relax on one of the many stunning beach resorts Malaysia has to offer in the island of Langkawi and this one comes with the added bonus of being completely duty free you know what that means..more shopping! But that certainly is not all this island is good for with miles of stunning coastlines to explore, beautiful waterfalls and amazing wildlife.